I traveled in January & February…but March I was back at home, as I will remain the first couple of weeks of April too. My mother in law had more medical stuff & a trip to Arizona during the month of March, so I kept busy taking her places & happy to report all things medical were good! Her travels for the winter are over too, which means she’ll be at the lake, welcoming Spring & many, many guests that love to come play during the summer. The time IN-beTweeN the two trips & the time I’ve been at home last month, had me "making things" once again. 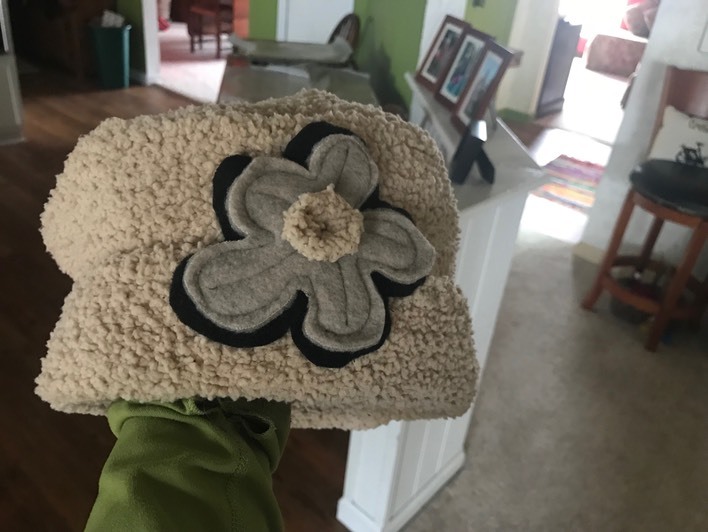 I made a couple of new winter hats using some old scarves I had…just cut up some old crap to make something new! 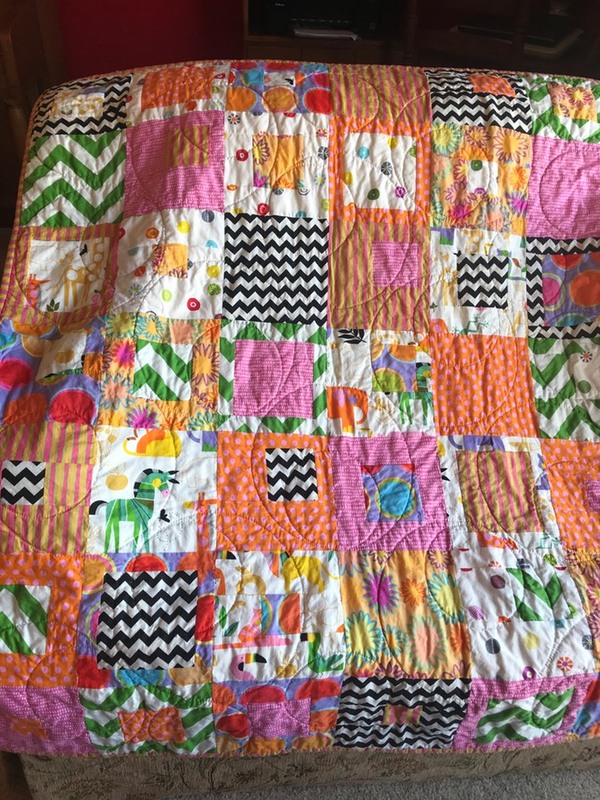 I needed to finish putting together & quilting a baby quilt for my nephews new baby girl due in late May. I may or may not be in town for the birth, so I wanted to have it finished & wrapped before my trip in April. I used the same pattern as I’d used for Emma’s, but with super bright fabrics. They know the baby is a girl, so I added lots of pink! I also made a couple of very random things. One day I decided I had to have a footstool for this ugly chair I detest, so I started shopping for one. It consumed me for about 36 hours. Of course I wanted a really cool one for about $20. I’m like a dog on a bone with some of my ideas, but they never last long…unless it’s travel…it’s a never ending want/desire/pull…. you get the picture. When I couldn’t find what I wanted, I found a free pattern online, came home, dug through my meager pile of fabric, & made one. It works great…even doubles as a meditation cushion. PS: I really thought I’d gotten rid of that stupid ugly chair (the plaid one in the background)…it was even out the door, in my car & on it’s way to goodwill just a few weeks after I made the footstool. But, sometimes we don’t always get what we want. The ugly chair made it’s way back into the house (but not back into the living room), making me crazy! 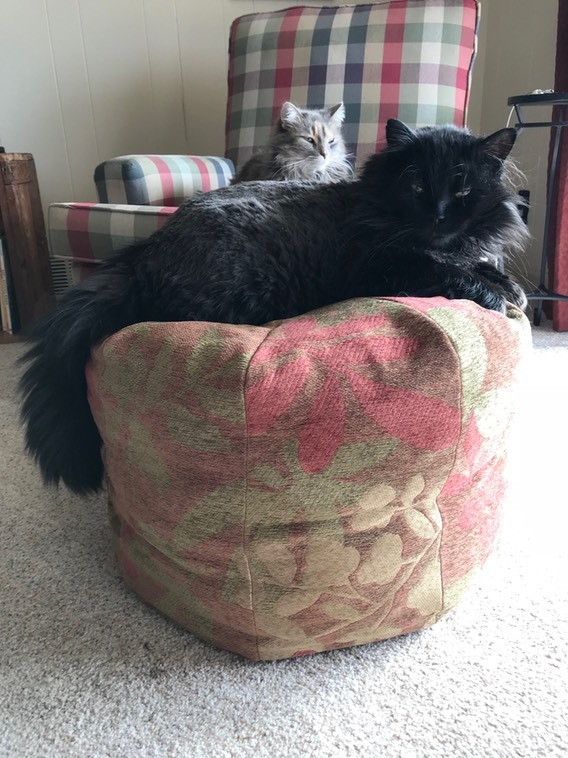 But, that’s a really, long, stupid story…anyway, I do like the footstool, which is now sitting alone in my living room. And, the cats like it too. 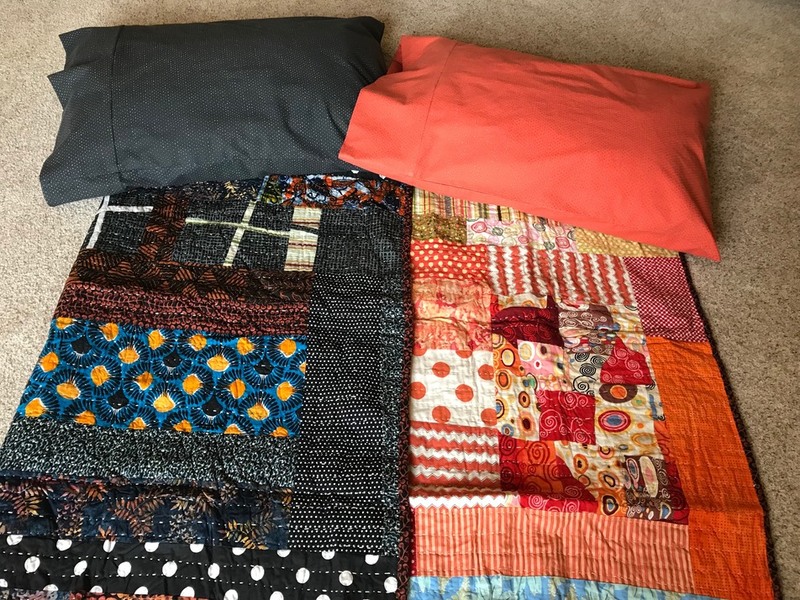 My next & last project was to make a couple of colorful pillowcases to match my camping quilt. One side is bright & one side is dark. In the past I’ve always just taken my one set of pillowcases…pale yellow, with me camping. I wanted something cheerful! 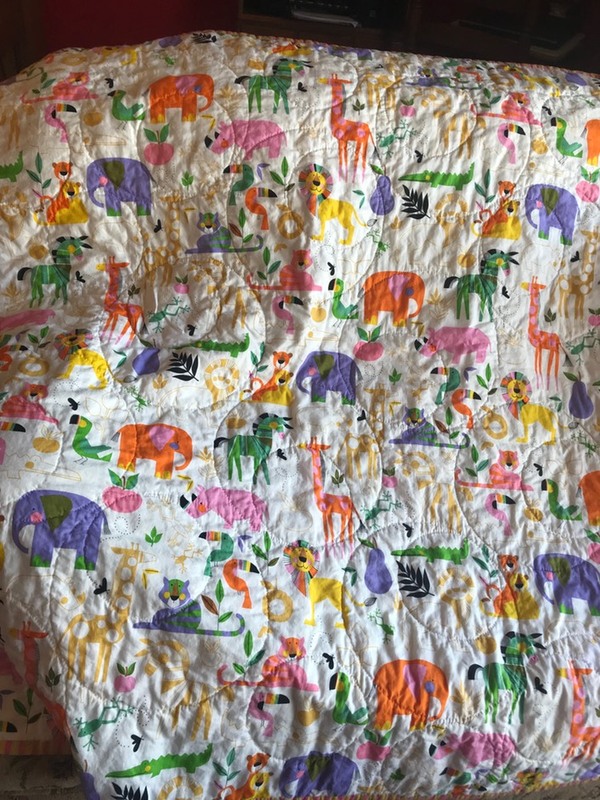 Who knew pillowcase making was a little complicated? It turns out, the way to make them is with French seams…meaning no raw seams show….even from the inside. I found a you-tube video that made it all go smoothly…even if I had to replay it & follow it a second time to make the second case. But, they’re done & I love them! I was done with my projects, but there was something else creative I wanted to SEE. Nathan Sawaya is a Lego artist I’ve been following for about three years on Instagram. 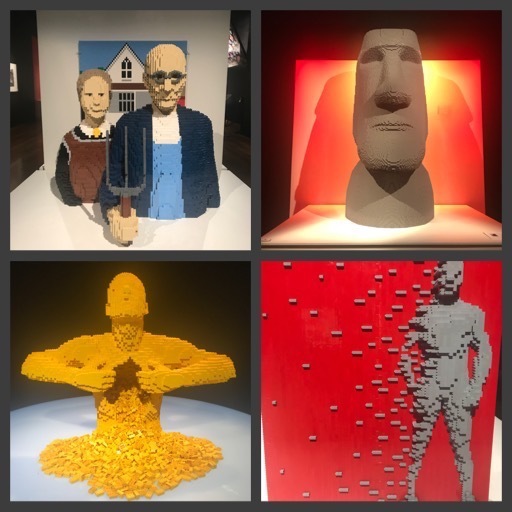 His exhibition, “The Art of the Brick”, came to Kansas City, so as soon as I got some time, I went to see it. WOW! He creates amazing things using Legos; there are 100 exhibits on display. Replicas of famous paintings & statues. Quirky things like giant pencils & peace signs. He had a whole section of very soulful type creations with his words on what they each meant to him. Next to each of the pieces there is a card telling you how many Lego’s built that piece & how much time it took him, along with whatever he named that particular piece. It was great! April is here & it still feels like winter. We had snow & freezing temps on Easter & this Friday, April 6th, the temp is supposed to drop to 16 at night! Yikes! I miss the warm sunshine of Florida! I’ve also been reading, reading, reading! Lots & Lots of books! My camping stuff is mostly in my bedroom…I didn’t put it too far away after the last trip. When the next warm day rolls around, I’ll remove the back seats from Camper, vacuum the inside & start packing it. A new California atlas arrived today…so spring/summer trip planning will begin in detail in the next few days. I don’t leave until mid-April, but I can’t wait! So, sooner better than later. I have my packing lists made out for the next three trips…a little ahead of myself, but I’m sooooo ready to go!